Okay, helllll no! Today's beer is a tease from Jonny.. but he's in Manitoba, so he's going to deal with it too! A beer called Pray For Snow?! Eff that. Being in Manitoba, it's winter 9 months per year (or so it seems). Just the other day we had a windchill of -30C and my skin breaks out and hurts a lot because of said wind. 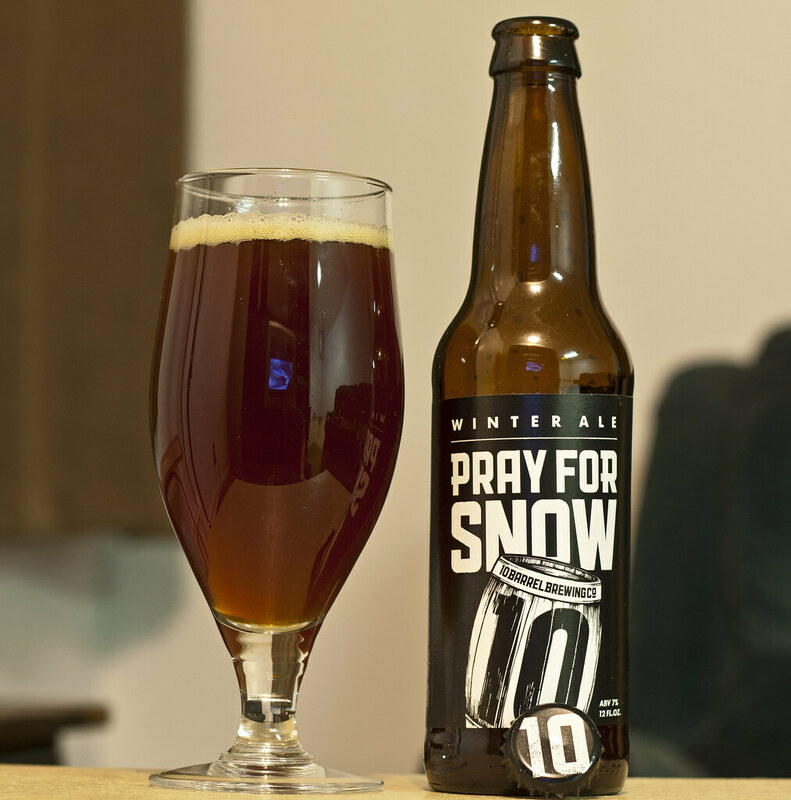 Apparently in places like Bend, Oregon, where Pray for Snow is brewed over at 10 Barrel Brewing, they don't deal with Canadian prairie winter, a fiercely cold season that is full of snow and icy winds. Heck, Winnipeg is the COLDEST CITY ON THE PLANET with a population of 500,000+. Hell, Hell (Norway) is warmer than Manitoba right now! (if it happens to be another season, it's currently 3C/38F in Hell, while -17C/1F in Winnipeg. What is the real hell. Ahahaha! Okay okay okay.. winter makes us stronger here on the prairies and appreciate beer even more.. even though we don't have anywhere as many brewpubs as well.. any other town in North America.. to be honest. Appearance: A thick hazy caramel amber ale, brownish, honey hue, more vibrant than the dirt used on the city streets to improve traction and minimize the amount of salt used. Beige-yellow cookie dough foam, not going anywhere. Aroma: A bit of a prairie pilsner aroma to it, meaning a grainy scent, but with a caramel sweetness from the malt, a bit bready. Taste: A caramel dark ale, a bit roasty, sweet, toffee and molassesy, a bit nutty and a bit of a sweet caramel aftertaste that hits the tongue. Quite tasty, lightly bitter and lightly creamy mouthfeel. Overall Thoughts: I still don't pray for snow, my skin hurts from the cold cold wind as it is. I do pray for more money so I can vacation somewheres with dry heat and lots of sun! A very good strong Amber Ale, lots of caramel and toffee notes to it, a bit of prairie pilsner barley aroma to it, but overall a very good dark amber. Great aroma and flavour for this time of year.